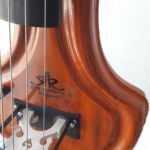 The Ray Ramírez Compact Bass is the result of our years of research and development and the experience working with the finest professional bassists local and around the world. 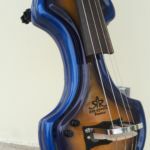 Our new “Compact Bass” is available with this new undersized body design and also a lightweight body to provide an alternative to high flying rates when travelling to other countries with your Bass. 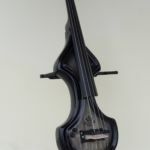 Our instruments are completely hand made and special attention has been given to: neck, body and electronics construction. The wood for all our necks is carefully selected for acoustic resonance, stability and beautiful grain. 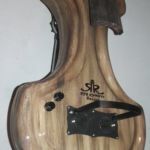 Our necks are made from a list of different domestic and/or exotic woods. Among them select Tiger Maple, Hard Rock maple, Bubinga, Purple Heart, Capa Prieto, Majó, etc. We follow our wood selection with Urethane durable finishes and usie only the highest quality components available. Our pickups are custom Ray Ramírez, combined with some of the best active onboard circuits, among them: Bartolini, Aguilar, etc…. 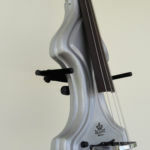 Our new model is a Custom Design that transcends what is available in music stores. 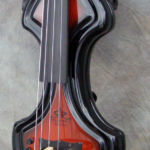 Our continued efforts to offer better and improved products to the bass players has resulted in this widely accepted instrument that is a pleasure to travel with. The little giant, the Compact Series is the ultimate in the avenue. Compact body with Big sound are two of the features of the “Compact Series EUB”. 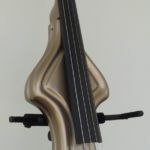 Its Elegant and dynamic design, the body contours perfectly proportioned, the sound with depth and high definition, made this instrument an appraised jewel among all bass players. 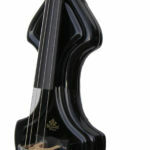 The Ray Ramírez Compact Series EUB offered the versatility of a lightweight, compact and elegant instrument. It’s Fiberglass Body with a hollow interior and its unmatched Ramírez Electronic, provide an “Electro- Acoustic” nature that results in a High Definition sound full of “Sustain and Growl”. Each instrument is Hand Made by Ray Ramírez, putting special attention to the most fine production, detail, quality and sound definition.